The house was my home for some time therefore our aim is to make your holiday as enjoyable as possible and we would like to think that Taigh Mairi will be like a home from home for you too. 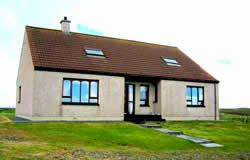 Taigh Mairi has been built in a stunning location with fabulous views of both North Uist and Benbecula. It is ideally situated just off the main road through the small Island of Grimsay, that lies between North Uist and Benbecula. The house has 2 bedrooms downstairs and 2 upstairs, 3 of which are ensuite and the main bathroom is downstairs. The house is heated throughout by gas Central Heating. The kitchen is well equipped with everything that you would expect including a dishwasher, microwave and electric oven & hob and there are washing and drying facilites in the utility room. The living room has a Hi-Fi, TV and DVD player with a selection of DVDs and CDs and if you can't find anything to watch there are always the spectacular views from the window! We are a short walk from the beach and the house is also just under a minute's walk to the bus stop for the main bus route through the islands. Taigh Mairi has a variety of facilities including a travel cot, baby monitors, bottle warmer, high chair and a selection of toys to make your stay more comfortable. We are a short walk from the beach and the house is also just under a minutes walk to the bus stop for the main bus route through the islands.As parents of 3 young children we know what it is like taking them on holiday so Taigh Mairi has a variety of facilities including a travel cot, high chair and a selection of toys to make your stay more comfortable. I would also like to take this opportunity to tell you a wee bit about the island that I grew up on. Grimsay is a small, peaceful, beautiful island which is skirted by the main causeway carrying the road from North Uist to Benbecula. The island is renowned for the quality of the seafood caught off its shores, particularly its lobsters and I would highly recommend a visit to the harbour in Kallin. North Uist is a paradise for wildlife and beach lovers, one of the best places to visit is the Balranald Nature Reserve and my favourite beach has to be Hosta with Baleshare a close second. Whilst travelling around North Uist there are many interesting sites nearby, such as Barpa Langais, Teampall Na Trionaid and the very picturesque Scolpaig Tower. Please email using the details above to check up to date availability. Available weeks are on my own site which can be accessed using the link provided above.